Colleen Kelly is the Executive Director of Vantage Point. Kelly has been associated with Vantage Point since 1999, and currently leads a team of seven paid staff and approximately 204 volunteers. Vantage Point makes it easy for organizations to lead, plan, govern and work with the right people to deliver their missions. Kelly served as a member of the Voluntary Sector Steering Committee of the Voluntary Sector Initiative and as Co-chair of the National Volunteerism Initiative Table. She worked to develop the Canada Volunteerism Initiative that the Prime Minister announced as a legacy to the International Year of Volunteers in 2001. Outside of Canada, she has spoken to audiences in Cape Town, Amsterdam, New York, Barcelona and Sao Paulo, Brazil on such topics as board governance, employer-supported volunteerism, engaging skilled volunteers and A People Lens©. As a volunteer in her spare time in Vancouver, Kelly has served as a Director on the boards of Volunteer BC, Leadership Vancouver, the Centre for Child Development and the Centre for Sustainability. 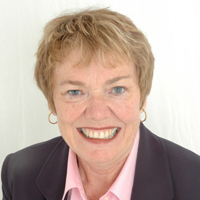 She has also been a member of the Health and Social Development Allocations Committee and the Vancouver Foundation; a member of the planning and chair of the volunteer committee for the CIVIVUS World Assembly in Vancouver; a member of the committee to evaluate the Vancouver Foundation granting process; and an organizational leadership volunteer with Canadian Red Cross. Kelly is the mother of four grown children and four grandchildren. She and her husband, Gerry, live in Vancouver, BC Canada.